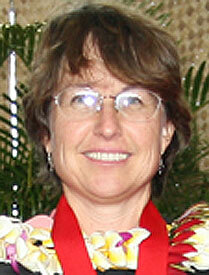 Lisa Parr is an instructor of marine science at UH Hilo. She has a dynamic teaching style that captures her students’ attention and is able to explain difficult and complicated ideas. Parr always gets students involved, whether in lecture, lab or in the field. Her capacity for teaching students to interact with their community has raised the level of expectation in the marine science department as a whole. “She is passionate about seeing her students succeed and shows them ways of teaching themselves through real life experiences and field activities,” noted a colleague. Parr is an excellent teacher, advisor and mentor who wants the best for her students. Select a recipient for more about that individual or view winners from 2002-2006.